The Quilter's Quarter MarkerTM will make you a better quilter. It gives you a perfect match every time. Mark quarter inch seam allowances and match points with ease and precision. Makes perfect set-in pieces a breeze. In each corner of the tool, there's a hole drilled at the intersection of the quarter inch seam lines, and in the center you'll find the 90o angle. So, when you need to sew a triangle to a square, you just mark your pieces with the appropriate angle, and match up the dots. No more guessing how much to offset the pieces, and no more 'unsewing' your guesswork. Especially useful for patterns with set-in seams, such as tumbling blocks and star patterns. 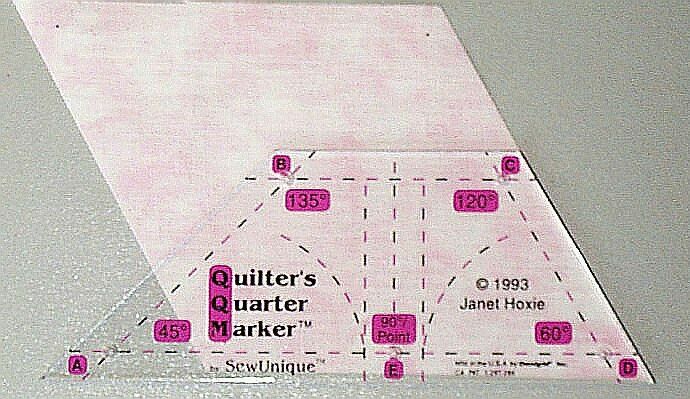 Giving you the angles most commonly used, 45, 60, 90, 120, and 135o the Quilter's Quarter MarkerTM is one tool every quilter should have. Works best with a .5mm mechanical pencil. Check out our Quilter's Marking PencilTM.